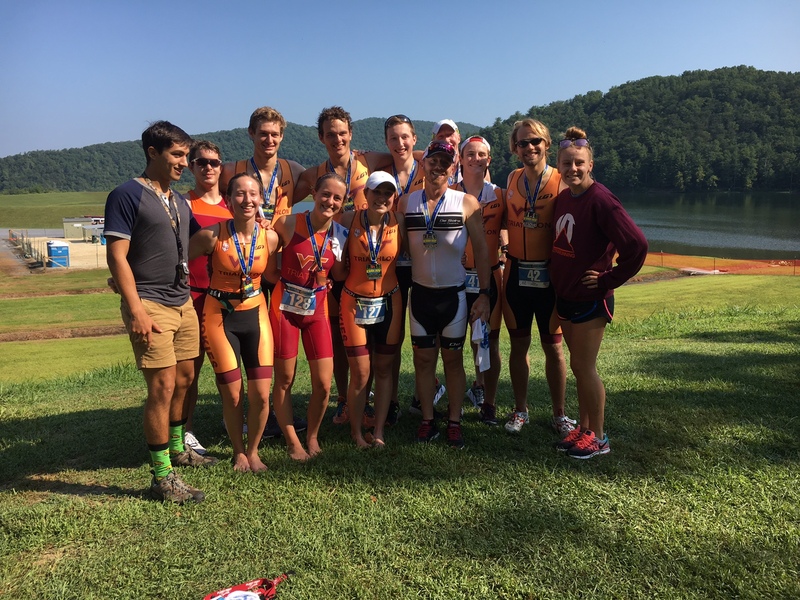 Local Triathlete, Allysah Fox, a Senior at Virginia Tech, competed in the Luray Triathlon Hawksbill Double. This was her first time ever competing in a double triathlon but her second year participating in the Luray Triathlon. Last year she raced the Luray Sprint Triathlon as her first triathlon ever. 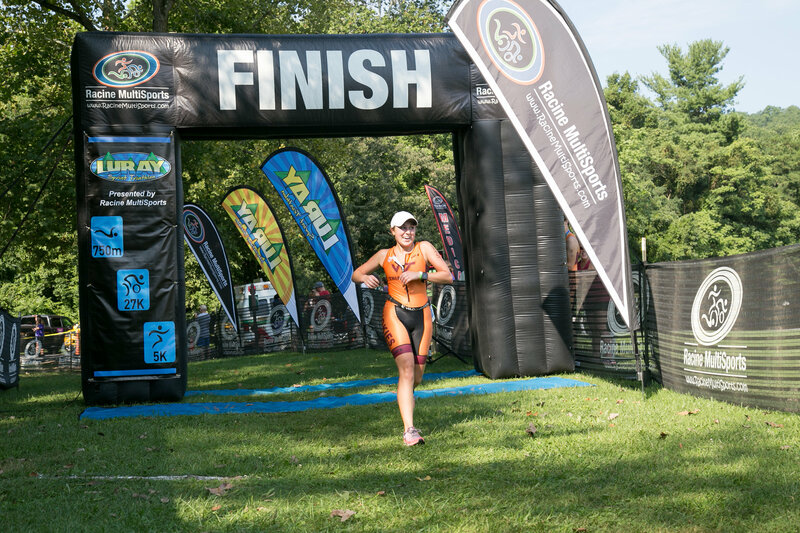 We had a chance to ask her a few questions about herself and her experience with the Luray Triathlon. I am a senior at Virginia Tech majoring in multimedia journalism and double minoring in business and professional and technical writing. I am the vice president of the Virginia Tech Triathlon Club, which is how I met my wonderful and athletic friends! During the school year I have an internship with Virginia Tech Magazine, and this summer I had the opportunity to work for Hawksbill Brewing Company – I love both of my jobs and my bosses! I grew up in Luray just a quarter mile past Lake Arrowhead, so I’ve been familiar with the race course long before the Luray Triathlon officially began. Truth be told, I was a couch potato growing up. But, my older sister convinced me to join the cross country team in high school, and since then I’ve been obsessed with the endorphins! 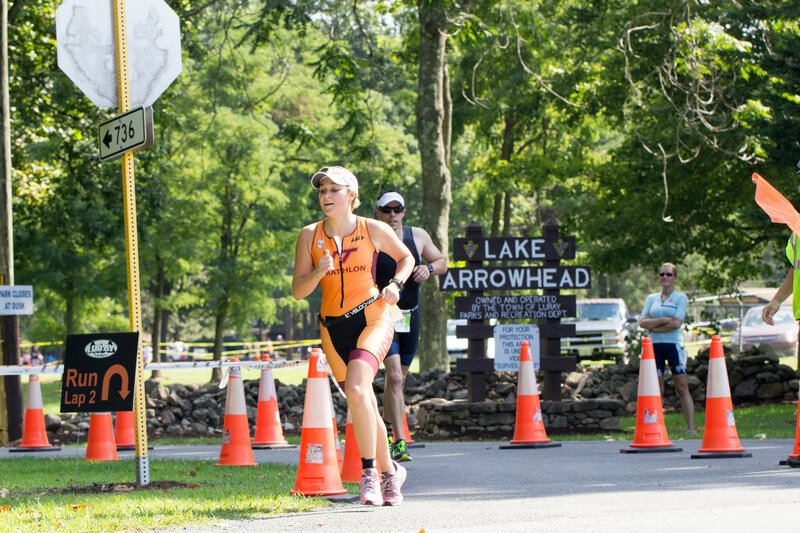 Have you competed in the Luray Triathlon before? This is my second year participating in the Luray Triathlon. Last year I raced the sprint distance which was my first triathlon ever! Since 2006, I have volunteered for the triathlon. I was always inspired by the people who completed the race! I can even remember an 84-year-old woman completing the sprint distance and it was truly incredible! At first I was intimidated, but once you learn to love the pain, it becomes a great bonding experience with the other participants and the sport. Have you participated in any other triathlons before this? I have! The VT Triathlon Club participates in a number of triathlons during the school year. Since August 2016, I have completed three sprint distance triathlons and three olympic distance triathlons. Is this the first time you have done a double Triathlon? What convinced you to try the double? This was my first time competing in the Hawksbill Double. My boyfriend, who also raced Luray in 2016, convinced me to sign up for the double. I was hesitant at first, but I knew I could push myself to finish it. I honestly loved it! I had a smile on my face the entire weekend! My biggest weakness was always the bike, so I made myself bike as often as possible. It wasn’t until the middle of summer that my boss pointed out to me that I had been neglecting the left shifter this whole time. What a difference that made! I typically averaged 100 miles per week between swimming, biking and running. I definitely had an advantage because I could train on the course and master most of the hills. In addition, my boss and I would meet at 4:30 am three days a week and travel to the nearest pool (which was an hour away) to swim. I stayed motivated by simulating the feeling of personal satisfaction at the end of the weekend. I didn’t want to finish the race knowing I could have given more effort. Tell me about your race weekend experience. To my surprise, several members of the VT Triathlon Club signed up to race both Saturday and Sunday! I loved having friends from school experience what I always considered to be a holiday weekend. As always, I was impressed by the positive energy this race brings to my little town. I was excited to see so many familiar faces in the crowd, which was an added bonus – the support was amazing! Racine Multisports does an excellent job organizing the race and making sure the participants are taken care of. During the awards ceremony, there were runners still finishing the race. The announcer made sure to involve the crowd and they would cheer until the last person crossed the finish line. This only confirmed that triathletes are the best people around. When I compared my sprint distance times, I noticed I improved my time by nearly 20 minutes from last year (shock and surprise – it was mostly due to the bike). My only goal was to complete the Hawksbill Double, and I did! Definitely seeing my family and friends cheering for me along different portions of the race course. They like to make fun because I smile too much when I’m supposed to be in pain, but I always have a great race photo! I will be the first person to sign up for the double again next year! My next competition will be a half Ironman distance race in the Outer Banks September 16. David Sours, Stefan Weston, Sam Forsyth, and I will be racing! Do you have any advice for someone considering doing the Luray Triathlon? It’s a challenging yet fun race. The scenery is beautiful, and the volunteers and spectators won’t let you frown. It’s a holiday in Luray!